Wide Front End Overlap - 1.65" Inches. Never Rust - Our high quality rigid aluminum is the longes lasting filter grille on the market. It will never rust, and will be easy to clean. The rigid Aluminum will keep its shape as in brand new condition. Rigid Design - Noise Free Components - No Vibrating Louvers Etc. Elegance - Beautifully Strutured To Add A Touch Of Upper Class To You Room And HVAC system. Powder-Coat Finish - Smooth, Shiny, Scratch-Resistant, Beautiful. Looks Like It Was Just Waxed. Measure the size of the air duct/drywall opening. Do not measure the overall size of the register itself, only measure the "hole" in the wall/duct. Every grille has a front end frame, that will overlap at wall joint. Total outer size of this grille is; listed size +2.5". The first number in a grille size, represents the width, the second number represents the height. Example: If your hole is 20" wide by 14" tall, order a 20x14. If your hole is 14" wide by 20" tall, order a 14x20. If you have any questions about this product by HVAC Premium, contact us by completing and submitting the form below. If you are looking for a specif part number, please include it with your message. 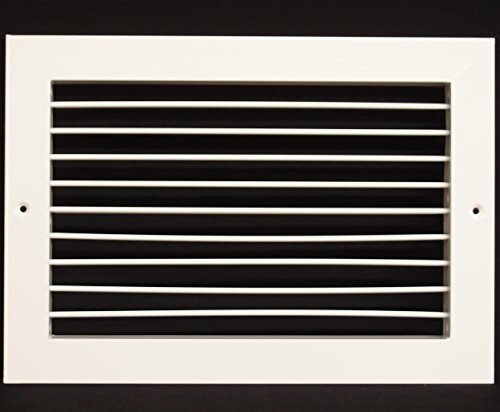 Air Vent 86159 Aluminum Foundation Vent, 16" X 8"
4 Section , Bimetal, Wall-hung ,Aluminum Heating Radiator.